Examinations provide an opportunity for Shintaido practitioners to have their practice assessed by several very senior instructors. This manual describes the roles of people involved in the examination process and what happens before, during and after the examination. Appendices A, B, C, and F prepared by Shin Aoki. The Exam Coordinator’s job requires many different talents and involves work before during and after the exam. This position may serve as an apprenticeship for exam Goreisha. Obtains the list of Examinees from the Gasshuku Manager/Registration Coordinator two weeks before the examinations. Produces Exam Evaluation forms for each Examinee. (See Appendix A, Appendix B, & Appendix C) Photo copies evaluation forms so that each Examiner has a copy of the form for each Examinee. Due to late registration, additional forms may be required immediately before the exams. Makes sure a copy machine is available. Collects Assistant and Graduate Recommendation Forms and Instructor Resumes. Delivers to Examiners. Schedules Assistant interviews with Examiners. In conjunction with the Facilities Coordinator, makes sure that indoor facilities are reserved. Makes sure tables, chairs, table clothes (dark color, not white), chairs, tent covering etc. are available. Oversees exam site set-up with facilities crew. Set up Examiner’s’ TablePlace table in a location with best visibility. If outside, sun should be behind the exam table. If inside, do not place near an entrance or exit. Background should be uncluttered. Examiner’s should be able to view entire performance, so there needs to be enough room for the Examinee to move freely , back and forth. If exams are held inside, table should be placed in one of the comers of room facing the center. Set up Additional Chairs for Special ExaminersProvide additional chairs and/or cushions for Examiners who do not sit at the table. In general place these chairs/cushions where there is the best visibility.. These Examiners may be asked to ensure the safety of the Examinees. Therefore, if exam is conducted outdoors, these place near any hazardous spots. Indoors, place near an exit or entrance. The Exam Coordinator makes sure that all physical aspects of the exam site remain stable. For example, he/she needs to notice if the table needs to be moved or audience repositioned. The Exam Coordinator is also responsible for making sure that the site remains secure (i.e. asks for quiet, prevents outside intrusion) A sample, “No Entry” sign is available in Word or PDF formats. The Exam Goreisha is responsible for coordinating the exam process. Like an orchestra conductor he/she must be aware of all aspects of the examination process including the physical layout, Examinees, Examiners and audience. The Goreisha needs to create an atmosphere which gives the Examinees an opportunity to perform to the best of their abilities. Since people are naturally nervous when taking an exam, the Goreisha needs to prepare in advance and communicate clearly so there will not be any confusion during the exams. Preparation before the examination an essential aspect of a successful process. Obtains a list of Examinees at least two weeks before the examination is held. Determines structure of the examination. Selects subjects to be examined for each Examinee. If there are many examinations to be conducted, the Goreisha may have to eliminate some of the subjects and/or reduce the amount of repetitions. Examinees’ movements may need to be combined. For example, toitsukihon and some katas can be performed in a group, not individually. Estimates length of exams and communicates this to Gasshuku Manager. Checks with Exam Coordinator to ensure he/she is informed and prepared. Surveys the exam site and approves arrangement. Reviews examination structure with Examiners. This should be done in advance of the Gasshuku if time permits. The Goreisha has responsibility for conducting the examination. process. During the exams, the Goreisha should not send his/her energy to the Examinee for support. The Goreisha should also remain somewhat “aloof”, and not provide too much support to the Examinees. This is a different gorei than one that is used during keiko. During the exams, the Goreisha should be in constant “non-verbal” communication with the Examiners, looking for signals to continue a movement or cut short a performance. The Goreisha needs to balance his/her verbal explanations with the understanding that Examinees are being tested on their ability to perform under pressure. This may be somewhat uncomfortable but is part of the process. Checks with Examiners and obtains approval regarding exam site arrangement. Explains to Examinees the sequence of examinations, seating arrangements and subjects to be examined. The order of examinations is Karate, Bo, Shintaido. (Refer to Appendix D & Appendix E for seating position for opening and closing bow and during examinations). Conducts first bow and formal opening statement for the examination. After formal rei, the Examinees remain in seiza until the Examiners stand up and return to the table. Positions the Examinee in a way that his/her technique will be easily seen by the Examiners (i.e. not too far away or too close. Give enough room to pass back and forth in front of the table). Concludes the examination with formal bow and closing remarks. The Examinees remain in seiza until they are excused by the Examiners and/or the Examiners stand up and return the to the table. The Goreisha’s job does not end after the final rei. Informs Examinees when feedback will occur. Attends Examiners’ evaluation session and provides comments. Of course, the person taking an exam (Examinee) is the “featured performer” and has a specific goal to achieve a specific rank. The Examinee will be asked to perform the Subjects to be Examined described in the Shintaido Examination Criteria. The Examinee may also be asked to show techniques not described in the Examination Criteria but appropriate to level of exam. 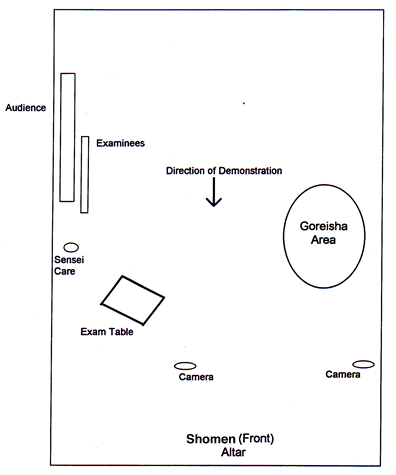 The Examinee can expect to receive clear instructions from the Exam Goreisha, but will not be given specific step-by-step direction. The Examinee’s performance is not simply an individualistic expression. An examination gives a Shintaido student the opportunity to show how he/she can act as a conduit for universal truth to shine through. Preparation immediately before an exam is obviously helpful but “cramming” may ultimately backfire. It is important to prepare long before the day of the exam by practicing in a sincere and consistent manner. Determines when and where exams will be held in any given year. The Regional and/or National Technical Director should be able to provide this information. Discusses his/her intention to take a particular exam with an instructor. The instructor can then supervise the Examinee’s regular keiko and make sure that the Examinee gets the necessary practice opportunities. Takes time to practice the required techniques with an instructor in the form of private lessons. Registers early with the Exam Coordinator/Gasshuku Registrar. 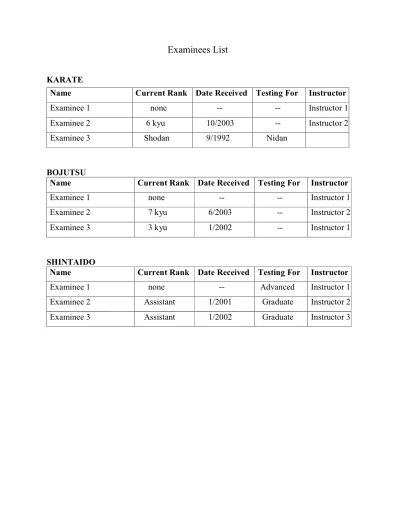 This is the first official step towards starting the exam kata. Practices with others who will be taking exams, if the exams are held during a gasshuku or workshop. Prepares a keiko gi that is neat and clean. (a little soap and ironing works fine). This type of proper presentation is taken into account by the Examiners. Brings extra clothing, water, sunblock etc that may be needed while sitting for long periods of time. Examinees are not judged on past performance. so it is important to “show your best” in the moment, at the time of the exam. On the day of the exams, the Examinee arrives at least 30 minutes before the starting time in order to warm up. 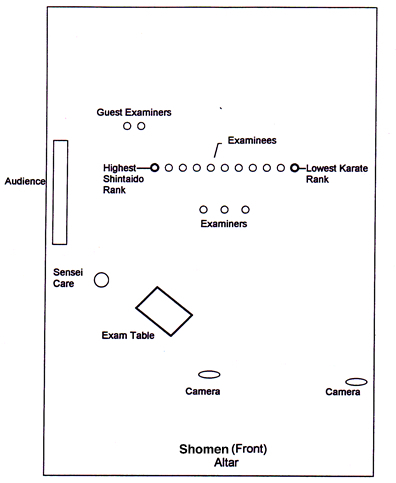 During the warm up period, take time to survey the layout of the exam dojo making sure where the Examiner’s table is located and where the exams will take place. When your name is called, answer “hai” or in English “present” . Stand up and bow before entering the exam “space”. Walk towards the Goreisha and bow to greet him/her. Position yourself in front of (not too close) the Examineer’s table and bow to them. The Examinee will first perform the required kihon. In the case of upper level exams, the Examinee may initially perform both kihon and kata or kata only. Kihon is usually performed in a group. The Examinees should be aware of the position and rhythm of the other members of the group, but should not look to each other for “correct techniques”. Examinees follow the gorei but do not assume the Goreisha will express the strong or directive type of energy provided in keiko. It is very important for the Examinee to show his/her own powerful energy expression and kokyu during kihon. Don’t hold back. Before performing a kata, the Examinee announces the name of the kata. 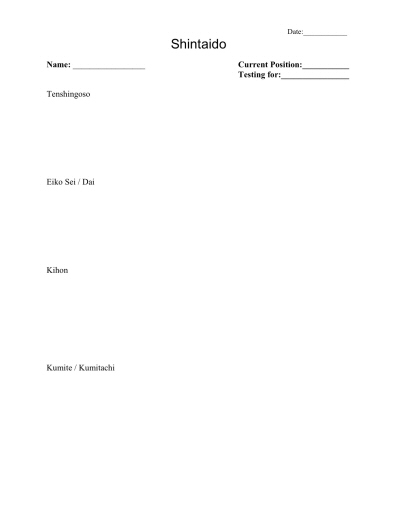 The Examinee positions him/herself so the Examiners can see all dimensions of the kata. The Goreisha determines kumite partners. In kumite where there is an attacker and defender, the attacker announces which attack will be used. In general, the junior member (kohai) attacks the senior member (sempai) first. Sometimes the Goreisha may determine who attacks first. 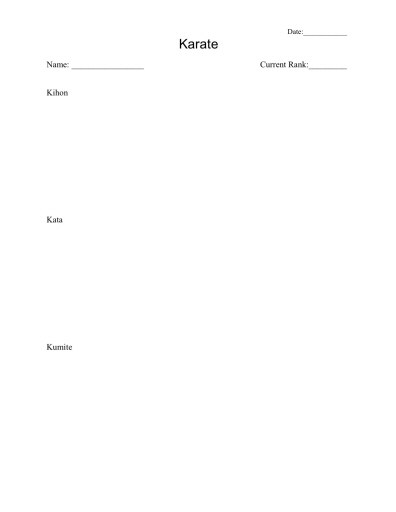 You can download the form in Word or PDF formats. You can download this sample in Word or PDF formats. The Member Resources section includes applications that are required for taking the Assistant and Graduate Shintaido exams. The fee structure for the exam process including exam fees and diploma fees are described in Appendix II of the organizational documents. The Examinations page has an overview and lists the necessary examiners for each level.